How do I label submissions? Organization team members and reviewers can add colorful labels to a submission to denote any kind of information. Labels help you organize and mark your submissions for easy reference and searching as your submission list grows. On the Submissions page, you can use the Search Filters feature to limit your list to include submissions that have certain labels. Submitters cannot see Labels and are not notified when labels are applied to their submissions. All levels of organization team members and reviewers can see all labels that are applied to submissions. 1. 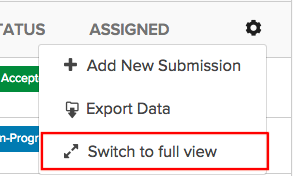 At the top of the submissions list, select the checkbox to the left of the submission you want to label. 3. Select an existing label from the drop-down menu or create a new label by choosing the Create New Label option. Click the Label button (shown below) at the top of right the page, to the left of the More drop down menu. 2. Select an existing label from the drop-down menu or create a new label by choosing the Create New Label option. Level 4 and 5 team members as well as the user who adds the label can remove a label from a submission by hovering the mouse cursor over the label and clicking the x. To remove a label from all submissions and delete the label from future use, click Delete next to the specific label. Please note: If you're viewing the submissions list and don't see any labels that you know have been previously attached to submissions, you may be looking at your list in compact view mode, which obscures labels in order to display more titles on the screen. To switch back to full view, click the gear wheel to the upper right and select the option for Switch to full view.